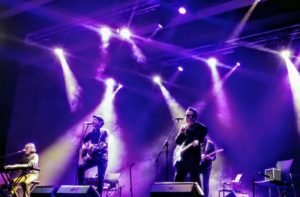 Mercury Rev bring their acoustic 20th anniversary shows to Europe in celebration of their opus Deserter’s Songs, and let the world into their inner dreamscapes in a powerful yet intimate performance. Ahead of the UK leg, Nathan Whittle gets a preview on the first of their dates in Spain. Twenty years ago, amidst the long and drawn out Britpop come down, came a ghostly euphoric album from upstate New York. Full of melancholic cadences and eerie orchestration, Mercury Rev’s Deserter’s Songs was an otherworldly album that floated down from the stars above. Clearly written during what was a dark time for the band, the album unexpectedly catapulted them to audiences they had only previously dreamed of. Two decades on, on these 20th anniversary shows, it’s time to find out whether the dark really has risen and reassess the album that brought the band to worldwide attention. As the lights fall throughout the venue, a child’s voice drifts out across the small crowd. He marvels at the world before him, wonders where he is before sparking up a brief conversation with a snake. It’s an extract from Antoine de Saint-Exupéry’s Little Prince, and the perfect introduction to tonight’s performance, one of scratching beneath the surface to find the hidden truth. As Jonathan Donahue and Grasshopper take to the stage, backed by a third guitarist and a keyboard player, there is a hushed and revered applause. The already beautifully bruised songs take on a spellbinding intensity when stripped back to their beginnings. Goddess On A Highway and Opus 40 still soar and naturally get the biggest reaction, but it is at their most plaintive where the band create truly spine-tingling moments. Holes sparkles with icy brittleness whilst at the same time draws you in with the warmth of its delivery and is revealed by Donahue to have been the song on the album that made them realise that they were onto something special and made them persevere through the darkness they had drifted into following the release of See You On The Other Side. It’s the idea of Donahue and Grasshopper opening up their own personal world to their fans that really makes the show special, as the songs are regularly interspersed with stories about what they were feeling when the album was being written, where they were at artistically and emotionally, and the journey they were then embarking on. They nod to their contemporaries of the time, bands that they felt akin to during both the recording of the record and in the subsequent upward trajectory they took. Amongst almost all songs from Deserter’s Songs there’s also room for versions of Pavement’s Here and Sparklehorse’s Sea Of Teeth, both of which are given the Mercury Rev treatment and fit perfectly into the narrative they have created for these anniversary shows. Of course nowadays the rehashing of classic albums as they approach their anniversaries has become the de rigeur thing to do, but the approach that Mercury Rev have taken on this tour is one that sets them apart from the rest. One can imagine that there was the temptation and voices advising that they pull out all the stops with strings and horn sections to truly recreate the sound that defined Deserter’s Songs, but it is to their merit that they have taken a giant step in the opposite direction. As Donahue explains early on in the concert, this performance represents the way that the songs were originally written, how they developed before they were recorded and layered with the instrumentation that added to the already ethereal nature of the songs themselves. The acoustics of each song shines through with Grasshoppers spaced out echo-laden hooks sparkling beneath Donahue’s voice that still straddles the space between fragility and urgency, transcending all around to leave you transfixed. On this anniversary tour, Mercury Rev have set about transforming the room into a looking glass into the Catskill Mountains back when they were writing the album, a time where the brittleness of the songs was laid bare, where improvisations and musical wanderings were encouraged just to see where the songs would take them. Beaming from ear to ear throughout the show and clearly relishing revisiting the album and stripping it back to basics, Donahue conducts the band with theatrical sweeps of his acoustic guitar, marking individuals to take the lead and then pulling each song back together. It’s not clear just how much of the songs’ development is rehearsed, but the occasional flitting sly smile between the four certainly shows that not everything is practiced and intended to be pitch-perfect. With all the songs from Deserter’s Songs given the treatment of this special show, the band sign off with The Dark Is Rising from the follow up album All Is Dream. It’s a clear message to close the show, just as it was back in 2001. When creating their opus, Mercury Rev had fallen into a dark place where despair reined. With the reaction to Deserter’s Songs their perseverance was validated and their status as cult heroes enshrined. With the darkness disappearing they could finally enjoy the embrace of audiences the world over to whom they had given eleven gems to treasure, and this tour is a celebration of it. Twenty years on, in a new light, the songs from Deserter’s Songs, played as they were first written, sound fresh, full of hope and vigour, and are presented in a mesmerising performance.